From the going green department... Balcones Burner Bash @ Balcones Recycling on Saturday, March 6th! Then an After Planet Rock Party At The Iron Gate With The B-Boy City Dj's! 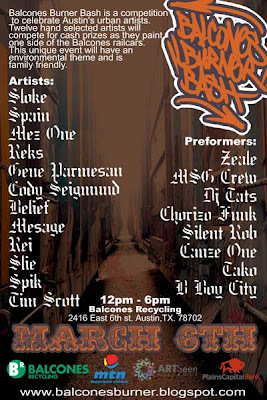 Balcones Burner Bash is a competition to celebrate Austin's urban artists. Twelve hand selected artists will compete for cash prizes as they paint one side of the Balcones railcars. This unique event will have an environmental theme and is family friendly.